Some 7.8 million American adults used e-cigarettes in 2016, according to data from the 2016 National Health Interview Survey, the source for CDC national smoking estimates. 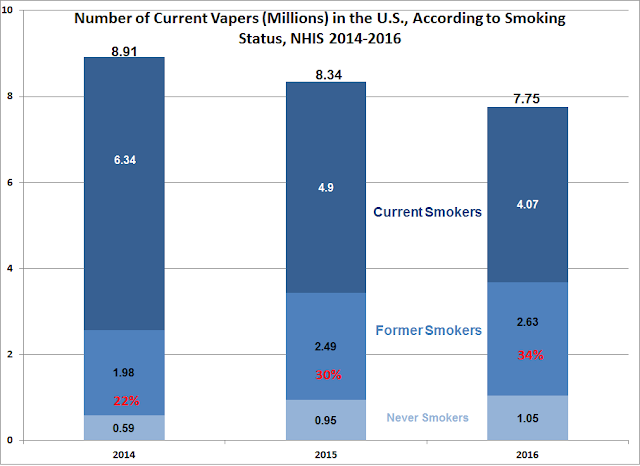 That is about half a million fewer than a year earlier, and 1.1 million fewer than in 2014, the first year NHIS surveyed for vaping. As the CDC reported a month ago (here), the 2016 data indicates 3.2% adult prevalence – 3.8% (about 4.5 million) for men, and 2.6%, (about 3.2 million) for women. The 2.63 million former smokers who are current vapers comprised an increasing percentage of all vapers, from 22% in 2014 to 34% in 2016. This is more evidence that smokers are using e-cigarettes to quit their habit. As the following chart shows, 88% of former smokers currently using e-cigarettes quit in the last 5 years, suggesting that e-cigarettes played a significant role. Meanwhile, 12% of former-smoker current-vapers quit 6+ years ago. The CDC admits that relapse among former smokers is common (here), so health advocates should applaud these former-smokers’ choice of e-cigarettes over far more dangerous cigarettes. As noted previously (here), the 2.6 million former smokers represent more than mere anecdotal evidence; their documented experience ought to carry substantial weight with government policymakers. In view of the important positive health implications of switching to smoke-free products, the number of former smokers ought to be growing faster. Unfortunately, the sustained war on all smoke-free products is likely suppressing broader transition away from cigarettes. The number of every-day e-cig users increased by 13% between 2014 and 2016. In 2014, the proportions of current, former and never smokers were 50% / 46% / 4%. By 2016 the proportions were 31% / 58% / 11%, indicating that more every-day e-cig users were former smokers. The number of some-day e-cigarette users dropped 24% from 2014 to 2016. The proportions of current, former and never smokers in 2014 were 80% / 12% / 8%. By 2016 the proportions were 66% / 19% / 15%. Addendum, October 27: The CDC reported on October 16 that the original NHIS 2016 file contained inaccurate sampling weights. The agency released corrected weights, which have been used to update all of the numbers in this post. 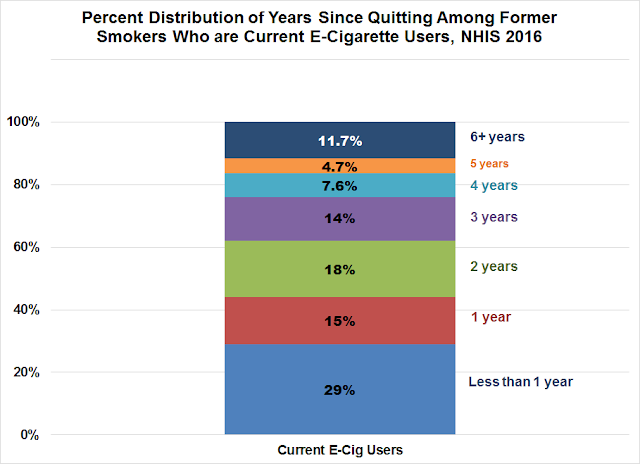 I see that The Lowering of Numbers taking up e-cigarettes to quit smoking in direct correlation to regultions and Fearmongering in the industry.